The author’s first U.S. tour began in April (2007) in Wisconsin, included stops in Los Angeles and San Diego, and concluded in May in Colorado. Ghermandi performed her work, All’ombra dei rami sfacciati carichi di fiori rosso vermiglio (In the Shadow of the Shameless Branches Laden with Bright Red Flowers), in its original Italian version. It recounts the story of a young girl and her family during the late 1970s regime change in Ethiopia. 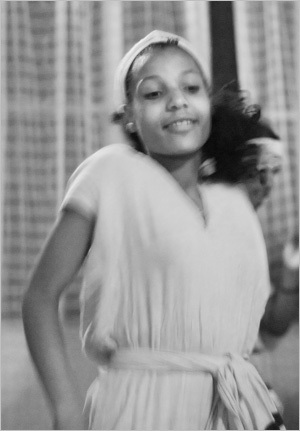 Through Ethiopian songs and expressions, the artist radiates the emotions and communal experiences of her protagonist. Learning to ride a bicycle becomes a collective event and one of conscious appreciation of Ethiopian culture, just like gathering with family and friends to watch television. 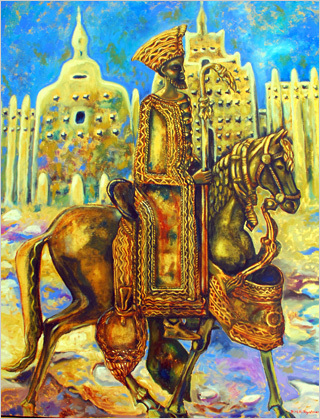 The work also depicts the influence of Italian colonialism on Ethiopian society. Ghermandi based her performance on the Ethiopian tradition of qene, a style of speech that creates double meaning of words and images, where one meaning remains on the surface while the other exists on a much deeper level. Gabriella Ghermandi’s writings, performances, and life resonate the interwoven and distinct cultural and political histories of Ethiopia. 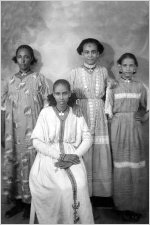 Her visit to Los Angeles, the U.S. city with the second largest Ethiopian population, demonstrates the far-reaching and significant impact of these histories. Born in Addis Ababa in 1965, Gabriella Ghermandi lived in Ethiopia until she was fourteen, when her mother, upon her husband’s death, moved the family to Bologna, Italy. Both Ghermandi’s mother and grandmother, born and raised in Eritrea, endured the devastating consequences of Italian discrimination and racial laws. Her Eritrean grandmother fell in love with an Italian officer and became pregnant with Ghermandi’s mother. Because of that, the author’s grandfather was seized by the Italian army and never returned to his family. 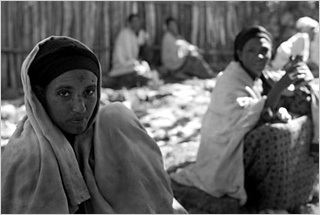 Ghermandi’s mother faced further racism at the Italian convent school she attended, where children of mixed origins were regarded as “the fruit of the devil.” After fascist rule, Ghermandi’s mother, who had meanwhile moved to Addis Ababa, was able to legitimately marry an Italian and had children. Her father, called to Ethiopia to fight against the British, decided to stay despite civil war and revolution. He considered Ethiopia his country and wished to be buried there. Once in Bologna, her father’s city of birth, Ghermandi felt lonely and homesick. In a city where, “People can watch you from the windows, but they never come to meet you,” Ghermandi longed for the sense of community she knew in Ethiopia. Her teachers and classmates, however, in an attempt of flattery, would say, “You could look like a girl from Sicily or Calabria.” Ghermandi responded: “How can you say that I’m like the others. You know that I have an entire country behind me, which is so different.” It was at this point that the author started writing. In school compositions, she noted, “I always tried to say something about Ethiopia.” In the Italian language, she discovered a way to create a home, a space in which she could gather the histories and traditions of Ethiopia and share them with others. “At the beginning writing was curing my homesickness,” stated Ghermandi. “It was the place where I could put my home in words.” As she wrote and made trips back to Ethiopia, the author’s homesickness subsided. She began writing short stories professionally and eventually embraced oral performances because she claims, “I want to meet the people who read my works.” Her oral performances and writings capture the personal experiences of Ethiopians who, many for the first time, tell their stories of incredible courage and sacrifice during Italian colonialism. Ghermandi’s visit could not come at a more important time. Visiting professor at UCLA Alessandra Di Maio has been teaching courses for the past year on issues of postcoloniality, the African diaspora in Europe, and emergent migrant literature in Italy. She invited Ghermandi because her works link personal and compelling accounts of colonialism to postcolonial identities and relationships. “Ghermandi’s art testifies to the fact that Africa and Italy have been involved with each other, for bad and good, longer than the Italian national discourse cares to remember. At its best, this liaison has produced powerful, imaginative voices such as Gabriella’s, whose echoes may resonate familiar to many people across continents and idioms”. In Italy, school children learn little about their country’s invasions of Ethiopia and the seriousness and extent of these occupations both in past and in recent events. 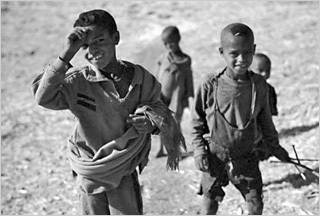 The most common approaches to Italy’s role in the Horn of Africa include ridicule of Mussolini’s ineffective and insignificant attempts to reconstruct an Italian empire and emphasis on the benign nature of public works projects for both Ethiopian and Italian populations. In fact, these views were expressed by one Italian professor who attended Ghermandi’s talk at San Diego State University—a testament to the need for personal accounts and open, reflective and critical discussion to supplement or supplant national myths. The author reminded the professor that “700,000 people were killed out of a population of ten million.” In the past few decades, since governmental archives during Italy’s colonial period have been opened to the public, more material has been published on the use of concentration camps and poisonous gas in territories colonized by Italians. However, general public knowledge of, and engagement in, these arguments remain low. 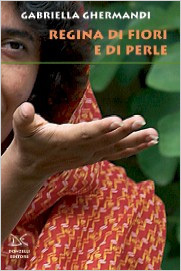 Ghermandi closed her visit at UCLA by reading from her first novel, Regina di fiori e di perle (Queen of Flower and Pearls), which has been published in Italy by Donzelli. In the novel, the writer artist incorporates fukarà, warrior songs, which pay homage to women’s role in the struggle against oppression. A historically based woman warrior is the protagonist of the story. For further information about Ghermandi’s work, her website www.gabriella-ghermandi.it houses many of her short stories and performances as well as family photographs. Mulay warned us he’d be waking us at 7:30 sharp. Due to our early bedtime, I was up long before he was. We were invited to sign a guest book at each camp, and were thrilled to see Brad Pitt had visited in 2004 when Mequat Mariam was the sole location—pre-Angelina and baby Zahara. The staff set up our lovely breakfast table outside on the sunny cliff edge, serving tasty scrambled eggs and rather dense pancakes with a locally-produced crystallized honey. Every night they asked our breakfast preference but with a large group, we always opted to share both dishes. Smiling staffers wished us good morning. Tea or coffee appeared before we even asked. While I trusted the praise I’d heard for TESFA, a small part of me had worried of finding locals gussied-up in pseudo bush gear obsequiously bringing us cocktails on a platter. Instead, the well-trained Mequat Mariam community treated us as family, happy to teach us Amharic and share the differences in our lives. The walk was rockier than the previous day’s. Hanna from the Addis TESFA office had described the paths as “boulder-strewn,” which sounded rather more romantic than it was. It was hard to find a flat spot at times and my feet frequently rolled out from under me. Of course, I was the only one klutzy enough to fall down. By the second day, I still hadn’t gotten used to the kids. I’d noticed their apparent love of tourists and complete lack of guile, yet after Gondar and Harar it didn’t seem possible they could really be sincere. But the more kids that approached with warm smiles, hands outstretched only to touch and not to beg, imploring to be photographed, just to see a shot of themselves, the more enraptured I was of the experience. Due to the crowd growing every time Jodie raised her camera, she eventually began arranging a posed group photo, creating a roar of children running from all corners to be included. Each child needed to say “hello” and hear it back. Each child needed to say “chao” and hear it back. It was almost unbearably cute, and was definitely a theme of the trek. I’d misunderstood what supplies would be available where, and had been under the impression that we would be wandering in and out of villages prepped for trekking groups throughout this hike. Unprepared, I ran out of water early in the day and relied on sweet Jodie to share a bit of her extra. I was completely parched by lunchtime and disappointed to see lunch was injera and shiro wat…I probably wouldn’t have enjoyed that anyway but having only soda to wash it down with and no prospect for water for another few hours, I had to abstain. Even less appealing, the injera had been folded up into itself to fit into the container and looked like a big brain. With mild distaste, I watched Mulay’s hand thrust into the thick center and retreat coated with shiro. At each lunchtime we received “fresh” donkeys (as the literature described) and a new local guide. I loved our grinning guides from Mequat Mariam but welcomed the new ones from Wajela. After a pleasant rest in the shade, while no one but Mulay touched the injera, we pressed on. Mulay was quite fond of British English, and charmingly told Nina that her countrymen were “custodians of the language.” It was sweet, if not just a little misguided. A clipped “press on!” quickly became one of the group’s phrases. Quite unfortunate that Mulay so dearly loved Nina’s English but Nina couldn’t be bothered to correctly pronounce any Amharic names and words. Her pronunciation of Lalibela as “lollyBEE-la” grated on my nerves and I doubted she ever properly thanked anyone with ameseganalehu. The second half of the hike was somewhat less interesting. Mulugeta asked if we wanted to continue along the escarpment or cut across the fields. Unclear on the difference but hoping this meant more interaction with people, perhaps visiting a home (not realizing that a home visit was a separately scheduled event), we voted for cutting across. It turned out it was nothing more than flat grasslands, actually containing fewer people than before. Later when we carefully mentioned that the previous day’s walk had been more beautiful, Mulay smiled sweetly and said well…he’d asked our opinion. Of course, we hadn’t known the difference between options when asked. Getting to Wajela camp involved a brief rocky descent. I envied people who never worried about tripping but as someone who’d twisted her ankles numerous times, I walked unsteadily while staring at the ground. I still stumbled. Wajela was colder than Mequat Mariam so we opted out of showering, although the fenced-in shower itself was picturesque against the moonrise. Our snack of crispy potato sticks wrapped in pieces of “Meket pizza” was so appetizing we easily polished off the heaving platter…although avoiding the injera at lunch undoubtedly increased our appetites. As we watched the sun go down, the camp manager noticed Jodie’s binoculars and asked to take a look. Fascinated, he spent a good thirty minutes searching the valley, locating the nearest church, the schools, and various small mammals. TESFA prided itself on its “eco-toilets with a view,” which were similar across camps. A tiny tukul at the cliff’s edge featured a seat placed over a drop toilet and a window facing the valley on the inaccessible side where no one could peek in. The toilet collected both kinds of waste for fertilizer. As there was no flush, users put down ash to diminish the smell. 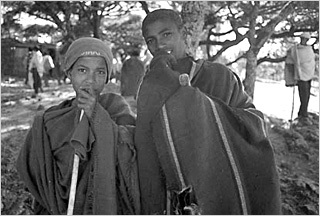 The accommodating camps provided toilet paper when available, although most trekkers probably came prepared. Wajela’s innovation was large water jugs with spigots for washing. At other camps, the staff patiently held a bowl of water and soap and rinsed our hands with a pitcher, but it was nice being able to handle that ourselves. The surprisingly delicious dinner was perfectly al dente spaghetti, which turned out to be the best rendition I had in the country. Sadly, the “shoulder-dancing” Mulugeta promised us never materialized due to the “expert dancer” of Wajela being unavailable. I dearly love community projects, especially ones as well-run as TESFA. 60% of each tourist’s fee goes to the Meket Woreda communities, for camp supplies, staff salaries, and reinvestment into the camp’s structures. The remainder is used in a manner voted on by the community, with one vote per household. The other 40% goes to the office support in Addis and Lalibela, and the Lalibela-based guides, who trek continuously with very little rest. Mulay’s doctor even told him he was too thin to eat fasting food twice a week, with his trekking schedule. As much as I love natural beauty or historical sights, my main focus while traveling is always the chance to interact with local people. TESFA provided exactly what I’d hoped for. As I headed toward the outhouse, a young cleaning woman motioned for me to wait. She filled a bucket with water, indiscriminately sloshed it into the tiny room, and with a proud smile deemed it ready for use. Combined with last night’s disbursement of plastic chamberpots, Filakit was getting surreal. Tourism in Ethiopia for Sustained Future Alternatives is a program run almost entirely between the office in Lalibela and the community of Meket Woreda, a district in the highlands. Additional support comes from the TESFA office in Addis, where British founder Mark and his Ethiopian co-worker Hanna work on the website, answer requests for information and schedule bookings. Save the Children UK was also affiliated, and had an office in Filakit. Through numerous questions to Hanna and her patient replies, I’d arranged to join a solo trekker named Jodie to save us both money, but needed help meeting this schedule with my limited time. A couple weeks before I left, Hanna informed me their contracted driver Habtamu would already be in Gondar, so I’d get the ride for half-price. Once Jochen joined up, the private ride—merciless as it was—cost less than flying to the usual starting point of Lalibela. We expected our trekking partners to show at 10AM, and had little to do other than watch the blanket-wrapped drivers negotiate the gas pump in front of the hotel. We moved down the road a bit to watch students heading off to school, a sea of forest-green uniforms whispering ferengi, ferengi. After exhausting Filakit’s possibilities, Jochen and I headed back for coffee. With Habte already on the road back to Lalibela, we were stuck trying to communicate on our own in a town devoid of English speakers. Our initial request for 2 cups of coffee (hulet buna, my mangled attempt at Amharic) was met with gales of laughter. We lingered over the strong brew but when conversation began to fail us, we tried to flag down the happy waitress again. She was in full-on “ignore” mode, yet she kept throwing quizzical glances our way. Was she wondering why we were still there? We watched Amarigna-speaking families enter, eat, and leave while we continued wondering about coffee. Eventually a waiter we recognized from the previous night came over. We tried asking for “hulet buna” again. He told us the price. We nodded OK. He waited a while, then left with questions still hanging in the air. We didn’t get any coffee. Perhaps he thought we had simply wanted to confirm the price. More than an hour later we eventually convinced someone to pour us a second cup. My guidebook was sparse on Amharic restaurant directives, and Jochen’s phrasebook of course only translated from German, but I figured if I stared at it long enough it would all make sense. What a relief when Jodie and Nina finally arrived after 11! With a warm smile, our trekking guide Mulugeta asked us to call him Mulay and insisted we eat lunch before starting off. The five of us easily shared a big vegetarian plate similar to the one Jochen had ordered for himself the previous day. We regaled our new companions with stories of the drive and of Filakit, most especially of the various toilet experiences. We had five days together, so we might as well get friendly. 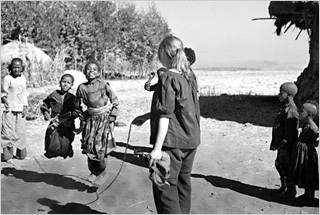 We piled into the car that brought Jodie and Nina from Lalibela and drove to the meeting point, where grinning teenaged boys gathered shyly. Not a single word was exchanged, only fascinated stares. The spell was broken when our local guide and porters arrived, and began to strategically load four people’s luggage plus a large amount of bedding onto two small, patient donkeys. Finally on our way, one small boy suddenly piped up for money. Mulugeta reminded him gently that this community welcomed tourists and wanted to show them the best side of Ethiopia, away from the harassment in other parts of the country. The boy sweetly promised to never ask again. Jodie taught high-school psychology and—like every other Australian I’ve ever met on the road—was from Melbourne. She was meeting her boyfriend for a group tour through East Africa later so she’d jumped on the chance to trek in Ethiopia first. Nina was a blustery physical therapist, an English gal of the “jolly” variety. Nina was in Ethiopia only for trekking as well—although the best-known sites are near enough to the historical circuit for quick visits—and immediately after this trek was headed to the Simien Mountains. I’d originally only known about Jodie but TESFA had managed to locate three other solo travelers who were willing to adjust their schedules. Our fifth, Jess, would come later. The first bit of climbing from the stream to the escarpment was steep, but after that the trek was as easygoing as we’d expected. 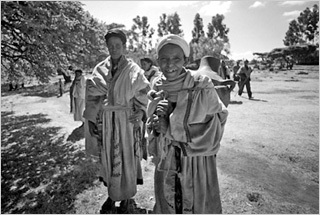 TESFA did not involve physically challenging hikes, but rather an opportunity to interact with people and observe life in the rural northern highlands. Maximum distance was about twenty-five kilometers and no more than six hours per day, although we often finished in five. We couldn’t get our eyes off a particular small boy on the same route, perhaps no more than 5 years old, who took his self-appointed task of harshly whipping cows with a stick quite seriously. However, it wasn’t our place to correct this behavior. Other children seemed to have little to do other than scamper after us, welcome us with outstretched hands and solemnly ask,”what is your name?” They never had any follow-up once we told them. We’d been wondering where all the adults were when we came upon a church in the typical rural style: round with a cross squarely at the center of its thatched roof. It was St. Maryam’s Day, and a large group of men gathered first to watch us enjoying the view from the cliff, then went back in the churchyard to drink a strangely sweet and foamy home-brewed barley beer. We agreed to try some, not expecting to receive a quart-sized metal cup to pass around. Mulay assured us most of these men would put away several large cups on any given Saint’s day. It wasn’t pleasant. Neither was the bread made in the church, nutty but dry and extremely filling. This was our first true taste of the Meket Woreda community, other than the children wandering in and out of our paths and our limited interaction with the local guide. The guide taught me to say konjo, or beautiful, and particularly applied it to the Ecuadorian woven purse I used as a camera bag. Other than that we could only exchange smiles. At the church we were able to see how far-flung neighbors came together and how much they enjoyed the growing tourist attention to their rural area—especially seeing photos of themselves. Not for the last time I wondered if I should have carried my point-and-shoot digital camera in addition to film, as I never had anything to show. Mequat Mariam camp emerged on the horizon after a mere three hours’ walk. The circular thatched huts called tukuls were modeled after traditional homes in the region, using materials donated by Save the Children UK and other charities. Inside however, we found clean, comfortable mattresses set into concrete hollows. The pretty bed covers were embroidered with traditional designs reminiscent of Lalibela’s crosses. Candles and matches were provided to deal with the nighttime dark, although we were all prepared with flashlights. Lining up to greet us, the polite staff welcomed us in English with great effort. I had misunderstood how the lodgings would work—I thought we’d be quartered in community homes but instead each community built these remarkable camps. Mequat Mariam was the original TESFA site, and currently the smallest. The single large tukul was divided into two spacious rooms. Jochen and I shared one side, while Nina and Jodie—who were rapidly bonding—took the other. Mulay was relegated to a tent, but the bedding we had carried with us from Lalibela would go into the new tukuls the community had nearly completed. We’d been told to expect a “snack” upon arrival at each camp, but while in the awkward process of pulling off our dirty boots and stinky socks, the courteous manager materialized with an overflowing plate of “Meket pizza”—wheat-based injera spread with a tasty tomato-onion chutney. With unlimited servings of coffee or tea and not a hint of the sourness of tef-based injera, it was hard to avoid making a meal of it. After a dusty couple of days, with hair still refusing to lay flat since the drive from Gondar, I ached for a shower. Striking a balance between the rural lack of running water and the foreigner’s need for private upright bathing, a stall of wooden sticks with a door that didn’t quite close was set some distance from the tukuls. The staff filled the canvas waterproof bladder large enough to wash two people with conservative usage. Water dripped rapidly upon turning the knob, so ideally, bathers would turn it off while soaping up. Rather chilly despite TESFA’s romantic description of sun-warmed water, especially in the cooler air temperatures of December. But with the sun shining and views of the valley below through the spaces in the stall, it was a beautiful way to get clean. Mulay decided we were ready for beer. The “rock bar” was an outcrop at the edge of the escarpment where we could drink and watch the sunset. The rock was very uneven in spots, so while I’d been relieved to change into flip-flops after the trek, I would have been more secure clambering over that last boulder in my boots. Our candlelit dinner was served in the dining tukul around 7:30, while we were still quite full of Meket pizza. At 3000 meters, the night was so cool we arrived at dinner wrapped in our jackets, gloves, hats and scarves, but the campfire inside the room had the desired effect. To our delight the meal was injera-free: a scrumptious vegetable soup, a potato-based sauce with chicken and a spinach wat with rice. Everything was tasty and hot, prepared in a separate cooking tukul. I’ve always been disinclined toward safari-type hyper-luxury accommodations in the African bush, but our first night at Mequat Mariam proved that TESFA’s organizers understood how to provide its paying clients with relative indulgences in an appropriate way. Laughing was the only possible reaction. “This is the worst ride I’ve ever taken!” Jochen shouted over the noise of the rattling car. “I’ve been on much worse!” I yelled back flippantly. I had—the choppy dirt path climbing to Parque Nacional Celaque in Honduras, which I foolishly undertook in a jittery moto-taxi, or the road winding through the Ecuadorean Andes toward Chugchilán, so narrow that every bump threatened to toss the busload of praying passengers off the cliff. The difference in Ethiopia was that this rough patch lasted 6 hours. By the end I fully admitted Jochen was right. I’d expected the car to collect me from Circle Hotel at 8:00. Several apologetic phone calls later, Habtamu arrived sometime after 9 claiming that Jochen caused the delay by changing money. Later I found out that easygoing Habte had kicked back and ordered breakfast after the transaction was already complete. Jochen, a friendly German with a sweet smile, hoped to visit every continent before he turned 30. People with “before I’m 30″ plans make me itch. By coincidence, I’d split a taxi into Gondar with him the previous morning. Spurred to visit by a half-Ethiopian half-Eritrean close friend back in Cologne who’d waxed poetic on Ethiopia’s beauty, he was a former professional-level runner who now worked in sports journalism. He’d brought a small videocamera and interviewed marathoners in Addis Ababa soon after the annual high-altitude Great Ethiopian Run, and was quite jazzed about his footage. We raced along the paved road from Gondar, the wind whipping my hair into a tangled snarl. Suddenly making a sharp left turn, Habtamu intoned, “asphalt is finished”…and the turbulence began. Hours of jarred organs later, we vibrated into an extremely basic restaurant filled with wary eyes. Small children discussed terms with Habte and appeared to be watching the car or possibly washing it (at this point, why?) while we had lunch. As strangers, we were shy about sharing and instead ordered separately: I got tibs, Habte got kitfo, and Jochen got the fasting food mixed platter that easily would have fed all three of us. Kitfo is raw ground beef and looked like brains. My opinion did not improve after Habte allowed me a sample. The bumps intensified after lunch, including one jolt so strong I hit the roof. Jochen burst out laughing, but it was less funny by the fourth time. I’d begun the day with an astounding tej hangover and was having trouble focusing. I could not re-hydrate because the very thought of water sloshing inside me was revolting. Habte generously invited us to tea so we stopped in another village. Although we sat right next to the car, he still paid some kids to watch it. I hoped soda could settle my roiling stomach but no such luck. Amazingly, the road grew still worse due to construction. Eventually asphalt would connect Gondar and Lalibela, but there were three more years of work ahead. When the road crew threw a shovelful of dirt on our car, Habte meticulously wiped off some of the mound with a tissue. Without rancor, he suddenly popped the lid and let the remaining dirt to fall into the engine, setting us on another fit of giggles. A couple of the elusive Chinese engineers supposedly distributed all over Ethiopia were reviewing blueprints with their foremen. We exchanged looks of vague recognition. My head still throbbed as we pulled into a Filakit truck stop. In this tiny village, our small rooms cost a mere 15 birr. The outhouse reeked of urine on both the squat-toilet and shower sides. Mysteriously, the shower was operated from outside the stall. It was definitely time for a beer. We forced down a bit of shiro wat, neither Jochen or I particularly hungry. The electricity in Filakit shut off at 9, surely a downer for the boys playing foosball on the street, but this hotel had a generator that operated until 10:30. Departing at 5AM with the other buses, Habte went to bed while Jochen and I felt we shouldn’t waste the light. But as the night grew cold and an odd Kenyan man nearby started rambling about the joys of drinking mother’s milk directly from the breast, we downed our last beers and headed off. The first portion of this text was partially translated from the article by Jürgen Walburg for the Newspaper “Frankfurter Neue Presse”. Way beyond Africa and in the pulsing point of Frankfurt, the Black Continent is advancing to be the center of attraction and curiosity. 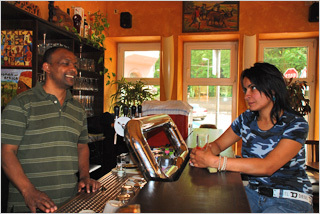 Particularly in the Klingerstrasse, near the main headquarter of AOK, Lalibela Restaurant has been an insider tip for those who enjoy exotic delicacy for the last 20 years; and latterly also for artists and art lovers. Since April 1, 2008, for the twenties anniversary of Lalibela, the owner of the restaurant, Mesfin Woldamlak, opened an art gallery as a present to his customers and himself. On the opening day, the gallery has displayed the lifework of a German artist Rose-Marie Rychner. 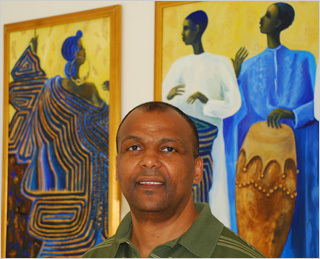 The artist, whose work is mainly influenced by African Art, was born in Aschaffenburg (Germany). Although she is living now back in her home town, Rose-Marie Rychner has spent 25 adventurous years in Africa where she traveled to teach art and handicraft in countries like Senegal, Ivory Coast, Uganda and Botswana. As we have visited Gallery Lalibela, Mesfin told us that it has been his long time dream to get involved in the world of Art. His ambition is to give artists a starting push to make their work available and known to the public. 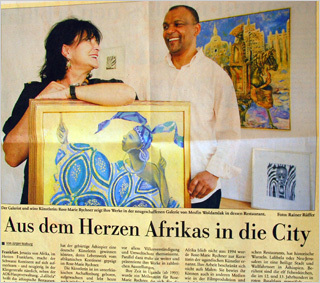 Mesfin knows how expensive for unknown artists it is to organize their own exhibitions in the center of an important financial metropolis like Frankfurt. Most galleries are oriented to displaying works from already known artists. 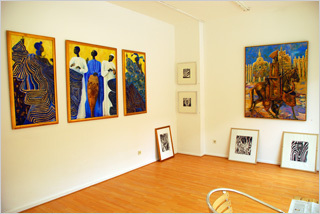 Because of its central location, Mesfin’s gallery is a great opportunity for new comer artists. Art lovers will also benefit from this combination because the gallery and the restaurant are on the same road and next to each other. Means, those who are visiting the exhibitions can be served with beverages and food for an affordable price. 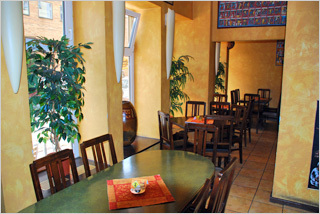 Gallery Lalibela is a new way of serving the public. This project is different and innovative; a Restaurant with its own gallery next door. Mesfin is obviously spending his hard-earned money on this project to keep the exhibitions running. We highly value his motivation and encourage artists and art lovers to visit Lalibela and enjoy the art works and have a productive chat with Mesfin about future exhibitions. Let me state my great appreciation on the reaction towards my article. Specially for those comments that gave me a perspective to view my situation from different sides. Thank you Beminet for sharing your own experience and Admassu for translating the German stuff. Reading your story, I felt the pain you have been going through all those years. I could say that you are a very strong guy who has managed to compensate his daily life even though he made a false decision. On the other side, I would also say that you are lucky to enjoy the presence of your all time love. By the way, her husband and your wife are amazing and outstanding personalities. So brother, you got to be happy because you got such a great and an understanding wife. But some still say, what I am feeling is not worth to be called “Love”. Is my feeling just an emotional eruption the way Senayit (chekagnwa Senayit) bluntly described? If a pain of no-yet-love hurts so much, can any one describe me how the pain of the already-love is going to be. If the pain of love is more torturing than my situation, I am lucky that I haven’t gone that far. Abiy said, love is like a grapefruit with a bitter test behind its sweetness. Fortunately, I don’t like grapefruit. I don’t accept that love should be like that at all. I am sure, where grapefruit grows, I will certainly find orange or other fruits without a bitter after effect about them. Though I should not talk about love yet, but my heart is still bleeding. So I can’t help coming back and pour out some more L… story. After a long self-persuading process, I have decided to call her. You know, I just wanted to hear her voice. Her very first reply was “Manew?” (Who is calling?) and it didn’t do me any good to hear her answering like that. I knew she has still my number and that she could see my name on her cell phone. I was somehow disappointed but tried not show my disappointment. I said instead that it was me calling. There was a very long silence on the other end. I couldn’t help asking if she was still there. Her next reply was “Min tifeligaleh?” (What do you want?) I said, I just wanted to hear her voice and that I think it is alright to do so. We ended up quarreling as usual; she asked me to do her a favor and never call her again and I promised angrily that I would do her that favor and delete her number out of my cell phone. The truth is, I don’t need to delete her number because it is already engraved in my mind. God, I really hated her after this conversation, but only for about 15 minutes. After cooling my emotion up, I was occupied with her thoughts again. The effect of my phone call has deepened my sorrow though. I might follow Beminet’s advice and try to get her back. But she has this side of her that makes me boil and explode. Can you imagine the kind of life we would lead together if we always end up quarreling like that? Here is my lived story. I am sitting in my small office and traveling in my memory through time looking back in to my life experience. Maybe, the background story of this heavy burden on my shoulder which I was carrying around for so many years, might help you in some ways to make your own right decision. The story is: I made on those days a false decision. I thought, I had no future with her. But my decision was false because “future” has its own character and it defines our fate in a different way. Sometimes you know, we must let our fate form itself in order to gain a mental peace afterwards. It was of course a natural reaction that she met someone else after hearing my decision. And she met someone she really deserved. She has established a solid family, and she is very happy today because her life is full of harmony. We still are friends and understand each other well. I also have a good relation to her husband. That is because she is a person full of positive energy and character. One can not ignore her. It would have been the worst decision to make if I had ignored her. That way, I have still the opportunity to see her laughing and shining. And I? Unfortunately I am still suffering because of my decision and try, at least, to enjoy her presence. I can’t describe this feeling, but it is somehow a weird feeling..
Now, it is already five years since then. I am also married and have my own family. Whenever I see her, I see what is missing in my life. Actually, I should be happy. I feel sometimes my first daughter looks like her as if she were our child. And my wife? I don’t know if she likes the idea of my meeting my ex frequently, she knows that I still love her. My ex likes my wife and she does her best to show her that we are only friends and that she has no other feelings for me. She is quite serious about that because she hasn’t made a wrong decision for her life. I don’t know if my wife is suffering in this constellation because she hardly show her feeling; or I am maybe too blind to see it. One aspect is for sure, I am happy when I see her, and I will love her till the end of my life. I often think, how happy could I be if I had married her. She is great with words and the way she chooses her sentences to make life sweeter. She is always grateful about life and rejoice it. I have never met someone like her who enjoys being alive. Now Brother (to Mistre again) Think about your decision deeply. Be aware that such a decision can change your life entirely. And if it is the wrong decision, you will suffer for very long time. It is like doing a crime against your self. Is it wise to be genuinely in love and avoiding the chance of happiness at the same time? I am not sure. Do you really love her? If your answer is yes, is there someone you love even more? Sorry for asking that. I am asking because you said that you two have no future. 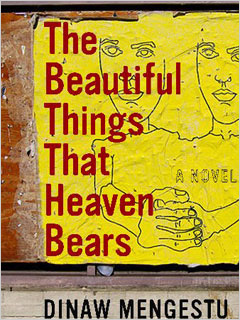 In his debut novel, The Beautiful Things Heaven Bears, Dinaw Mengestu tells a compelling story of immigration, loss, and gentrification set in an impoverished neighborhood in Washington, D.C. Sepha Stefanos immigrated from Ethiopia seventeen years ago, a journey that saw him fleeing Addis Ababa at age sixteen, the day after his father was taken from the family home and summarily killed. Stefanos’ journey took him to Kenya and eventually to his uncle Berhane’s home in Maryland, an apartment building where other Ethiopian immigrants live. After working for a few years and attending a year of college, Stefanos acquires a piece of the American dream when he opens a general store in the Logan Circle neighborhood of D.C.
Logan Circle is changing as the faces become paler and new homes are constructed; this is where Judith, a former professor and her bi-racial daughter, Naomi, enter into Stephanos’ life when they move next door to him. He is enchanted with Naomi’s precocious ways and the mysterious air of Judith. For a man who is a loner, occasionally picking up a neighborhood prostitute, he finds himself dreaming of the three of them as a family. But grandiose dreams are an illusion along with the hope that his store will prosper from the newcomers who have affluence written all over them. Will he be able to hold onto his slice of American pie? Mengestu gives readers an inside look at the hardships as well as the mental and emotional storms that immigrants suffer. They are black, yet different from African Americans in the U.S. in so many ways, trying to navigate the terrain of American life. While the story moved slowly and at times with little conflict, the details of Stephanos’ life were revealed, layer by layer, as if peeling a grape to get to the pulp of the story. The title, taken from Dante’s Inferno, is fitting as the language and imagery paint a picture of Heaven, Hell and Paradise. Mengestu read from his novel at Marcus Book Store in Oakland (there is a sizable Ethiopian population in the Oakland/Berkeley area) this past March to a mesmerized audience. Recommended for those who enjoy reading of immigrants’ experiences in a literary format. I come to Lissan quite often. The topics are carefully chosen and entertaining. But something essential is missing here. At first I didn’t know what is this missing part here because I was leading quite a normal life and my heart was not bleeding and hurting like it does now. The pain that I am experiencing now has such a positive name and whenever I heard it mentioned, I thought it could be like being in paradise. Now, with a bleeding heart in my chest, I know that it is neither paradise nor perfect. The pain is unbearable and I am looking for a place where I can shout out as loud as I can. That is when I recalled that there hasn’t been a topic in Lissan where love-tormented creatures like me would pour out their agony. I met this beautiful Abesha lij some months ago. If I start describing her physical appearance, I wouldn’t be able to find the right word and, most probably, I might end up distorting the perfection of nature. But there are two things that I would dare to mention: Her eyes and her smile. When I was lying beside her only 5 centimeters away, her big dark brown eyes and her disarming smile used to have such a hypnotizing effect upon me. And on those moments nothing else mattered. I remember lying like that for hours and hours forgetting time, place and reality. She used to say that I was making her uncomfortable by looking at her like that but I knew that she was just jocking. On the other hand, I still don’t understand how those eyes could loose their disarming beauty and wear a tiger glare and those smiles vanish and give a way to dismaying harsh and hurting words. We are departed now because we couldn’t cop up with our extreme situation. I haven’t seen her for days and I am almost dying. I don’t know what to say if I see her because I’ve already said everything to say and the result was completely the opposite. Why does a grown man feel helpless when it comes to confronting and demanding women? An imperfect woman demanding for perfection and a man who already knows that he couldn’t be perfect: a great combination, isn’t it? Anyways, why is my heart bleeding like this while I know there is no future for us? And when I think about her, why is it always those beautiful eyes and disarming smile appearing in my mind instead of the tiger glare and her hurting words? What should I do now? Am I already infected? Is that love? Let’s talk about it. 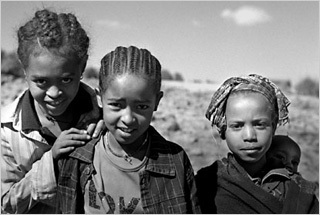 Children living on the rough streets of Addis Ababa, Ethiopia’s capitol, describe their days and nights of struggle. To better understand the mentality that keeps the children from seeking help, we speak with Dr. Minas Hiruy, the director of a local charity organization. He believes that, given a chance, the children can one day succeed. Yossi Tzagay moves his head and shoulders back and forth as though they were only temporarily attached to the rest of his body. The gasps he elicits in the audience give way to laughter at the pure virtuosity of his flowing movements. Soon he is joined by fellow dancers. Some of them copy his graceful movements with their heads and shoulders and others make sympathetic gestures with their bodies, gyrating and turning to the throbbing beat of the nearby drummers. After a few minutes, the dancers are joined by students of the Rubin Academy who have been invited to participate in this special class of Israels latest ethnic dance group, Eskesta, an Amharic name meaning appropriately enough “Shoulder Dance”. The students more or less the same age as the members of the group giggle nervously as they try out these strange body and head movements, although somehow their metabolism does not seem built for these acrobatics. But being the serious students they are they are soon copying the exotic gestures as best as their occidental bodies allow them. Another source of inspiration is the ritual and prayers of the Ethiopian synagogue of holy days such as the Sabbath and festivals or those derived from the Jewish life cycle, such as weddings and funerals. One of the dances in Eskestas repertoire is based directly on a dance performed (by men and women together) in the synagogue on Yom Kippur the Day of Atonement. If dancing in synagogue on the holiest day of the year seems strange to western eyes, the members of Eskesta point out that the aim of the dance is twofold to jump and become tired in order to be rid of ones sins and be purified, and in a state of purification to reach a level of joy that will allow the members of the congregation to reach Jerusalem. “This is what we did in the synagogue in Ethiopia, and it is this same dance we perform on stage,” explains Aviva Alkamo, one of the five lithesome women dancers in the present troupe. As if their journey was not traumatic enough, when they eventually reached Israel, the Ethiopians found themselves as strangers in a strange country, a millenium apart in culture and outlook. Ethiopia is one of the poorest countries in the poorest continent; Israel is one of the worlds leading countries in many spheres, including hi-tech, industry, and social innovation. In addition, the immigrants had the problem of language: many of them were not literate even in Amharic their own native tongue, and their very identity as Jews was constantly questioned. The students who were to form Eskesta are in many ways bridge builders. On the one hand they want to be accepted by their Israeli peers and integrate into their new environment; on the other, they wish to preserve and develop their own traditions which are almost entirely unknown in Israel. Inevitably, some of the earlier students dropped out, but others replaced them so that today there is a fairly stable core group who work together, rehearse and perform. In fact, an indication of their success is that every week they have to turn down requests by youngsters wishing to join the troupe, especially from the 200 or more Ethiopian students studying at the University of Haifa. The groups first hour-long programme included liturgy, instrumental music, two authentic folkdances from the areas of Tigre and Gondar, and a prayer suite, partly based on the ancient Gez language, in contrast to Amharic which is what the group generally speak among themselves. In order to research the piece the dancers had to confer with a kes who was deeply moved by the youngsters interest in wanting to retain and develop their ancient traditions. A second work is based on the daily cleansing ritual that is part of the Ethiopian Jewish tradition. Part of the pressures the group is under reflects the fact that they are all members of an immigrant community that has had more than its share of problems in the absorption process. Their vulnerability in the social, economic and political fields has made them a highly visible element on Israels sociological map. As modest as Eskesta is, it is thus fulfilling a far larger role than being simply a dance group. Each time they perform, the dancers are not merely bringing life to old forms but in a very tangible sense bringing dignity and vitality to an entire immigrant community. The wife of a star athlete here had the city buzzing for a few days some years back. The highlight of the couple’s marriage ceremony was marked by and was intent on breaking country record in the length of the bride’s wedding dress. If that was the bride’s childhood dream and that, she had at last been able to realize her fantasy, then good for her. However, you could easily sense it that the news had left a great number of people wondering if matrimonial ceremonies had anything to do with breaking records. More and more such ceremonies in many urban cities, much more in Addis, of course, are becoming exotic, more expensive (make that prohibitively expensive), and devoid of any enduring theme; traditional or otherwise. Cocktails receptions, which cost less, are running out of style. Full-fledged dinner parties are increasingly the “in-thing” now. Cocktail parties are being shunted now because they might send the wrong signal against people’s financial solvency. So the current common wisdom is, if you have to marry and have the dough, even better, if you have plenty of it, flaunt it. And you begin doing that by first booking at the Sheraton and all other considerations be dammed, including plain, old modesty. Wedding dinner parties at the Sheraton hotel are a unique experience in and of themselves, especially if it happens to be your first time at the place, even though repeat visitors won’t mind finding themselves there more often. You see yourself live on a huge screen( a first in your life) as well as other people you considered you had lost to emigration. The food is great (Michelin status), the dessert out of the world. The chinaware is fit for royalty. The service is five-star. Of course, it has to be that good because the couples that have to pay have do so through their noses. You can imagine the bill that comes at the end of a lavish meal for hundreds of people when routinely a cup of tea costs around 20 Birr. It is O.k. if couples get a kick out of paying a couple of hundred thousands; after all, it might be once in a lifetime experience, hopefully. It is their money, besides. Nobody begrudges them any pleasure they can squeeze out of that. Nevertheless, at the end of the day, one has this strange feeling nagging you. Is all the pomp and ceremony truly essential? The story is told about an Ethiopian residing in North America visiting here and who as it happened was invited to a wedding dinner party, where else but at the Sheraton. This person happened to be also an active member of a fund raising group for various Ethiopia cause in the host country. It is not impossible that the guy was positively impressed at the level of sophistication wedding parties here have reached. After all, not everyone in America have their weddings in five-star hotels. More tellingly, however, the guy was disgusted by the extravagance of it all. If Ethiopians can afford so much partying, why beg money abroad on their behalf? Maybe it isn’t as simple as that. It could be that many of the lavish nuptials that one finds taking place at Sheraton or at the Hilton have the expenses paid from abroad. Most couples that come to the country to tie the knot do so at these places. That is fine as long as the comfort level for those people demands that weddings take place at top-notch hotels. Times change. It is very different from the near past when you typical wedding celebration cost just a couple or so thousands and was a neighborhood affair. It is ironic that as our weddings are becoming more hybrid, second editions of both cultures, more of financial burdens, and even more stiflingly formal, when many far more affluent societies are going the opposite direction. In those countries, simpler marriage ceremonies are gaining popularity. Some of the marriage festivities have even social messages to transmit. 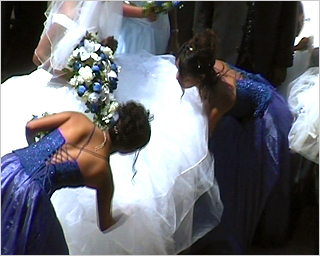 One such category discussed by a news magazine recently was what it called “Green Weddings.” Such a weeding is premised on the belief that wedding ceremonies don’t have to be wasteful affairs: Invitations use a “tree-free” recycled stationary, incorporating dried flowers or bits of fabric. Flowers consist of less costly blooms from backyards. Venues are chosen based on their being convenient to most invitees. Food and drink is simple. Locally available and seasonal.